Decorative garden railings, balustrades and handrails are a great addition to any property providing not only style and beauty but also security. This pretty railing has a simple lightweight design that suits this small garden in Willand perfectly. 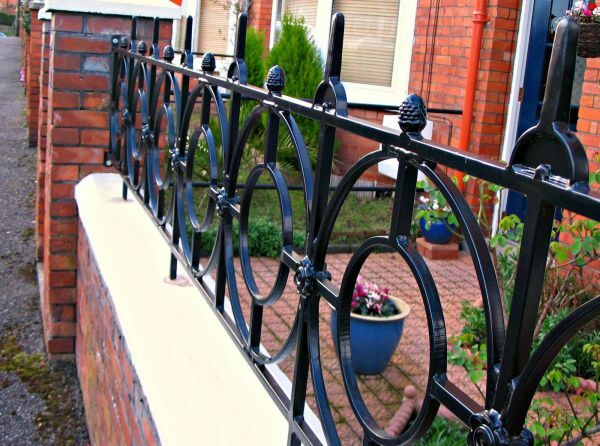 Metal railings and balustrades are an increasingly fashionable addition to people`s homes and ornamental wrought iron designs will add a touch of class and elegance to any property. These decorative railings were produced at our workshop in Cullompton, they were bespoke fabricated in mild steel and powder coated, then taken to Bournemouth and installed, they look impressive with the gold coloured railheads and it adds a touch of class to the property. We have worked in the south west for many years and we have produced many fine examples of bespoke metal work, so if you’re looking for a high quality product then, you need look no further than Devon Valley Fabrications. . 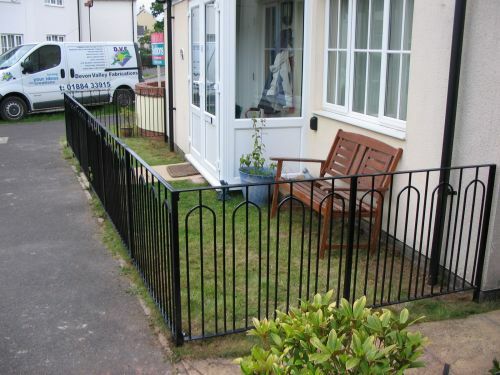 Here at DVF we can offer garden railings in varying designs tailored to your budget and design. concreted concreted in or bolted down to the ground depending upon your requirements and we will work wherever possible within your budget, often through minor variations in design detail we can find ways of achieving a target price and we are able to replicate wrought iron railings from a photo or a sketch. Railing heights are typically between 0.4 to 1.2 metres tall and give an additional level of security to any property, giving you peace of mind. Balustrades and handrails can be made to any height or width and are suitable to use on balconies, roof terraces, garden walls, patios, decking, or beside steps or stairs. 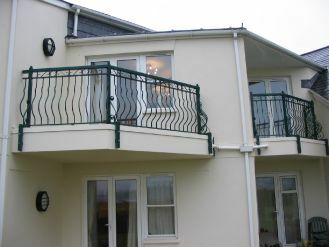 We can also fabricate juliet balconies to suit any building. Our bespoke metal fabrication service can offer you a unique product which is individual to you, we can curve the steel to give your railing an arched shape, use twisted, textured or hammered bar and there is a wide choice of railheads, scrolls, decorative panels, cages, flowers, rosettes, finials to use and many other ways of personalising your design. Industrial handrails and fencing for commercial premises…. We can fabricate handrails and fencing to a bespoke design, so it is tailor made to meet your exact requirements and we can offer you help and advice when choosing the design and style of the product so it can be practical or ornate whilst maintaining maximum security and safety. Our safety hand railings are made to the meet HSE standards minimum height of 1.1 metres, if the handrail does not have a full in fill panel under it then knee bars and kick plates are also a requirement on most applications. Our fencing is fabricated to withstand the weather, provide a solid barrier and prevent climbing through security spikes and no-footholds design, our commercial metal fencing is ideal for any commercial property wanting simple, practical security from office car parks to freight yards and industrial estates. 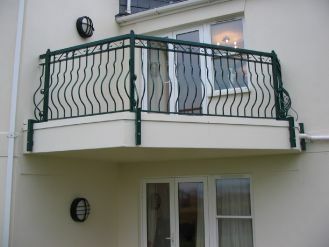 Your railing, fence, balustrade or handrail can sand blasted and given a powder coated finished. It is available in a range of colours, textures and gloss levels and is guaranteed for ten years. Also the products can also be galvanised, this process gives the best possible weather protection to mild steel, in addition to this a powder coated finish can be added to give an excellent looking finish. We can also add more paint detail using metallic colours, gold and silver are very popular. Our workshops are in Cullompton just off junction 28 of the M5. It is an ideal location to give us great access all across Devon, Cornwall, Somerset and Dorset. We are very close to Tiverton and Wellington, we are around a twenty minute drive to Exeter, Honiton and Taunton, thirty five minutes from Bridgwater and hour from Barnstaple, Plymouth and Bristol. Devon Valley Fabrications offer a complete installation service on all the products we fabricate, our fitters have years of experience, ensuring a smooth running installation and the highest possible quality standard. Please contact DVF for a free no obligation quote..
For further details please call Derek on 01884 33915. Or to send an email click here. Devon Valley Fabrications, Unit 8, Kingsmill Industrial Estate, Saunders Way, Cullompton, EX15 1BS.